Patrick Depailler was a man who liked to live life to the full. Born in the Auvergne in central France, Patrick was the son of an architect. He qualified as a dental technician although he had by now developed a passion for motorbikes and wanted to go racing. He began his career in 1962 and was immediately spotted by Jean-Pierre Beltoise as being a serious talent. Alas his career had to be put on hold for his military service but then Beltoise helped him get a drive in 1964 representing the Auvergne in the Coupe des Provinces series, racing Lotus Sevens. Depailler was second in his first race and by the summer was winning but at the end of the year he did not have the money to race cars any more and went back to motorcycles. It was not until the end of 1966 that he signed up for the Winfield School at Magny-Cours in order to try to win the Volant Shell. In the end he lost out to Francois Cevert but Beltoise convinced Alpine to sign Patrick on a three-year contract. He began racing Alpines in F3 and was soon winning races. He was also used by the team to race its sports car. Although there were promising showings in the years that followed it was not until 1971 that everything came together and Depailler won the French F3 title in dominant style. He later went to Britain and beat all the young heroes there. That win was taken away by the stewards for passing under a yellow flag but it led to an offer to drive for John Coombs in F2 with a March and 1973 Depailler confirmed his status as a rising star with victory for Alpine in the Monaco F3 race. Pushed by Elf and Coombs, he made his F1 debut with Tyrrell at the French GP at Clermont Ferrand alongside Jackie Stewart and Francois Cevert. 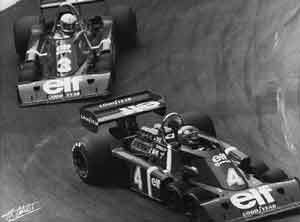 He would return to the team later in the year and again in 1973 when he continued in F2 with an Elf chassis. That year he was due to race for Tyrrell in the final two races of the year but crashed a motorcycle and broke his leg. Fate however decreed that despite this gaffe he would be a Tyrrell driver in 1974, following the death of Cevert. That year he also found the time to win the European Formula 2 title. Ferrari and McLaren had moved to the front in F1 and it was not until the arrival of the six-wheeled Tyrrell 034 in 1976 that the team looked really competitive again. Patrick was fourth in the World Championship but did not win a race. His first win did not come until the summer of 1978 when he won at Monaco. Despite that victory he moved to Ligier at the end of the year to join Jacques Laffite. The pair were dominate in the early races of 1979 with Patrick winning in Spain but he then ruined his chances when he broke both legs in a hang-gliding accident and missed the rest of the season. He signed to drive for Alfa Romeo and was trying to help the team improve its cars when he was killed in a testing crash at Hockenheim in the summer of 1980.